Changed Life of the Poor : Better Off, but Far Behind. Kind of related to the woman in the Onion article, this NYT article touches on increased inequality. Indeed, despite improved living standards, the poor have fallen further behind the middle class and the affluent in both income and consumption. The same global economic trends that have helped drive down the price of most goods also have limited the well-paying industrial jobs once available to a huge swath of working Americans. 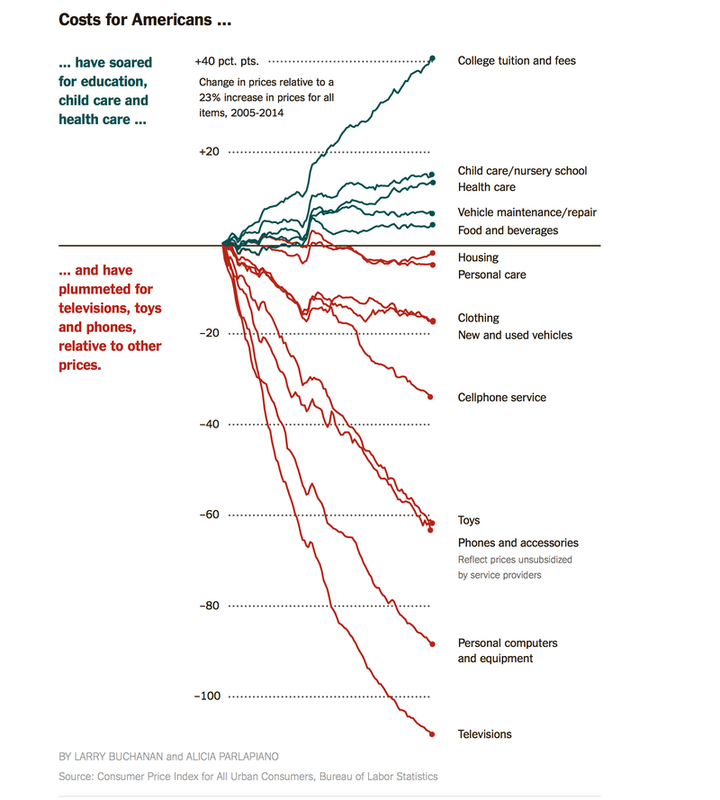 And the cost of many services crucial to escaping poverty — including education, health care and child care — has soared. For many working poor families, the most apt description of their finances and lifestyle might be fragile. Even with a steady paycheck, keeping the bills paid becomes a high-wire act and saving an impossibility. Tammie Hagen-Noey, a 49-year-old living in Richmond, Va., tapped at an iPhone as she sat on the porch of the group home where she lives — its proprietor is a friend of her daughter's. She earns $7.25 an hour at a local McDonald's, and makes a little extra money on the side from planting small plots of land for neighbors who want to garden. Ms. Hagen-Noey is trying to rebuild her finances, which have been decimated by divorce, government liens and addiction. At the top of her list of priorities is finding better-paid work. She produced a paycheck that showed her earnings so far this year: $2,938.51. "It's impossible," she said. "Every cent of that goes towards what I need." A few months ago, she sold her car for $500 to make rent. Two broad trends account for much of the change in poor families' consumption over the past generation: federal programs and falling prices. Since the 1960s, both Republican and Democratic administrations have expanded programs like food stamps and the earned-income tax credit. In 1967, government programs reduced one major poverty rate by about 1 percentage point. In 2012, they reduced the rate by nearly 13 percentage points. As a result, the differences in what poor and middle-class families consume on a day-to-day basis are much smaller than the differences in what they earn. "There's just a whole lot more assistance per low-income person than there ever has been," said Robert Rector, a senior research fellow at the conservative Heritage Foundation. "That is propping up the living standards to a considerable degree," he said, citing a number of statistics on housing, nutrition and other categories. Decades of economic growth, however, have been less successful in raising the incomes from work of many poor families, prompting a strong conservative critique this year that hundreds of billions of dollars in antipoverty programs have failed to make the poor less dependent on government. "If you handpick services and goods where there has been dramatic technological progress, then the fact that poor people can consume these items in 2014 and even rich people couldn't consume them in 1954 is hardly a meaningful distinction," said Gary Burtless, an economist at the Brookings Institution. "That's not telling you who is rich and who is poor, not in the way that Adam Smith and most everyone else since him thinks about poverty."